This is a wonderful resource for any teacher covering slavery in the Americas. 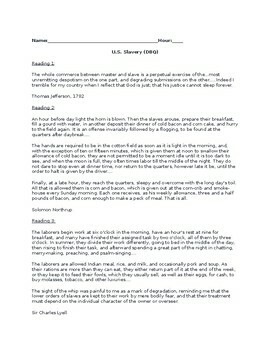 Students will start by reading six primary sources that discuss various issues related to slavery. They will use those primary sources to answer 3 questions that require deep critical thinking, and will test their ability to work with documents. 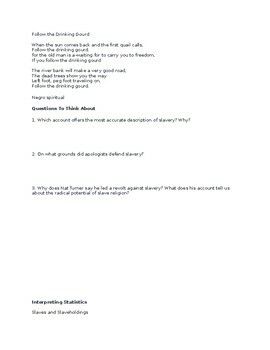 In the second part of this resource students will analyze and interpret 3 charts on slavery and slave holdings in America. They will then use the information they have gathered from the charts to answer 3 questions that help them breakdown the information from those charts. 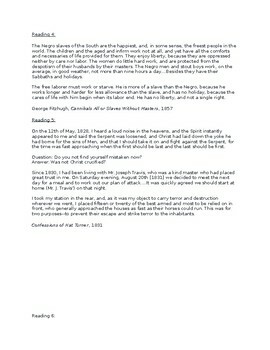 *Great resource for teachers covering slavery! *Great resource for getting students to analyze data!